So I’ve been told that the likelihood of a white Christmas is pretty much nil this year. After getting snowed in at my sister’s house a time or two you’d think I’d be ecstatic about this since Rob and I can’t stay any longer than we’ve allotted for our break, really. Rob has a show coming up and I’ve got lots and lots of fun projects I need to get on the stick about. In the end, I know it’s best if it’s warm and sunny and we can run around the front yard with cans of Silly String instead of slipping and sliding on the highway while cursing. Because if I’ve learned much it’s that Oklahoma doesn’t often get snow without terrible, icy roads. 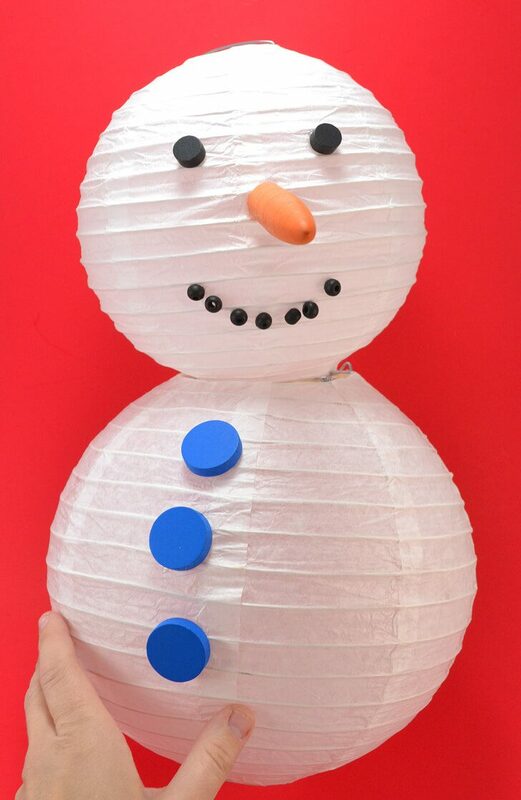 Since there will be no snowmen made due to no snow I decided to make my own with things I could easily find in the climate here. Is it tropical or sub-tropical or what? I couldn’t find the answer quick enough for impatient ol’ me on Google but, as a nursery owner informed my Mimmie last week, we had a freeze here like 2 years ago! 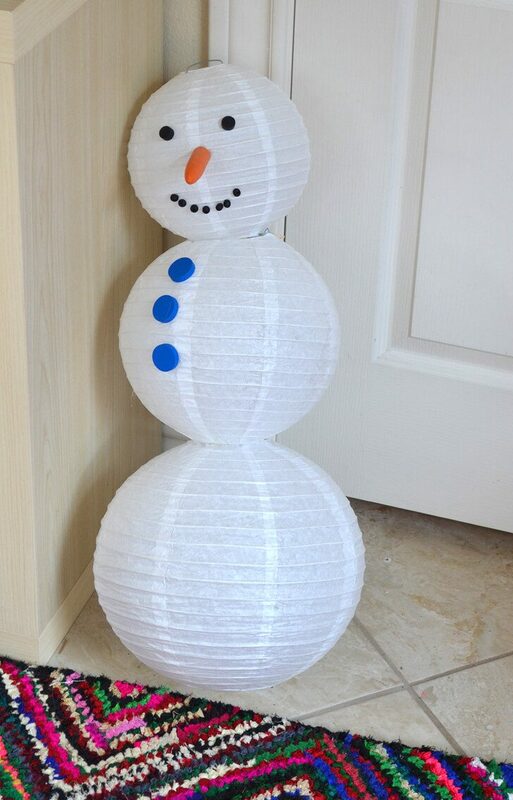 So when I went looking I was going to buy clay and buttons but I found this snowman making kit for, you know, SNOWmen. Erm, what? Wood clothes pins (the kind with springs) <– get these at Walmart. They are grossly overpriced online and in craft stores. There is a larger hole and a smaller hole. The smaller hole is the bottom. There are these metal forms and one end will have a hook type of thing. This goes on the top. 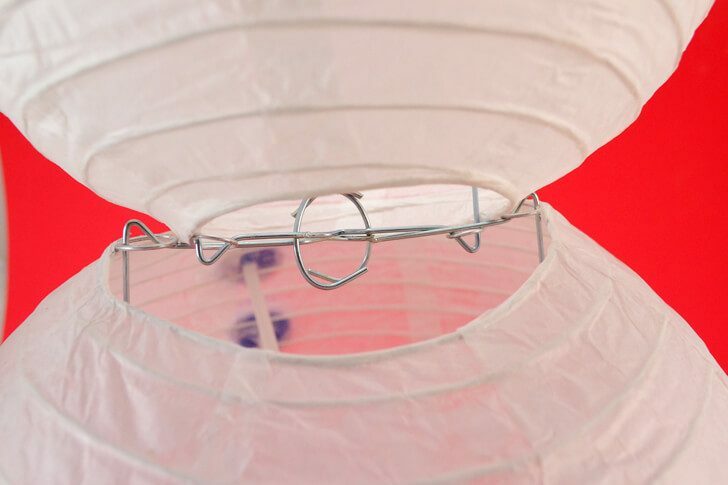 Now see how there are two loops on either side of the larger hole at the top of my lantern? The little areas on the metal form that look like itty bitty cat ears actually rest inside of those holes to keep the lantern together. 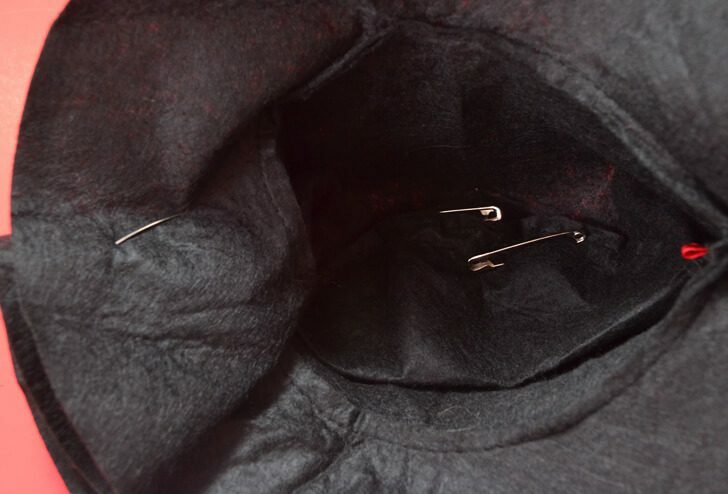 The paper of them stretches really taut and you might feel like you’re about to break the thing, but slide the form into the middle through the larger hold and push so that the metal catches on that opening. Pull the paper up and kind of push the metal down until the “ears” click into the metal eyes. You’re done! 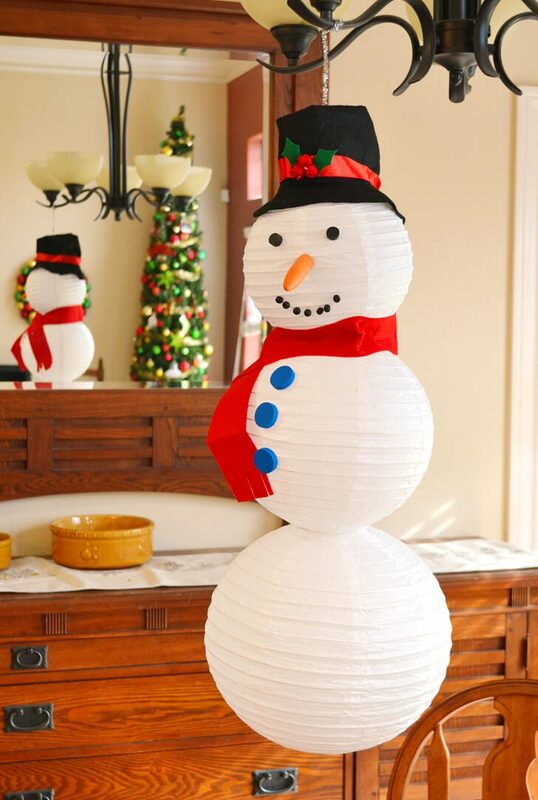 Snowmen needs hats. It’s a fact of snowman life. This was a felt hat that came with my kit. 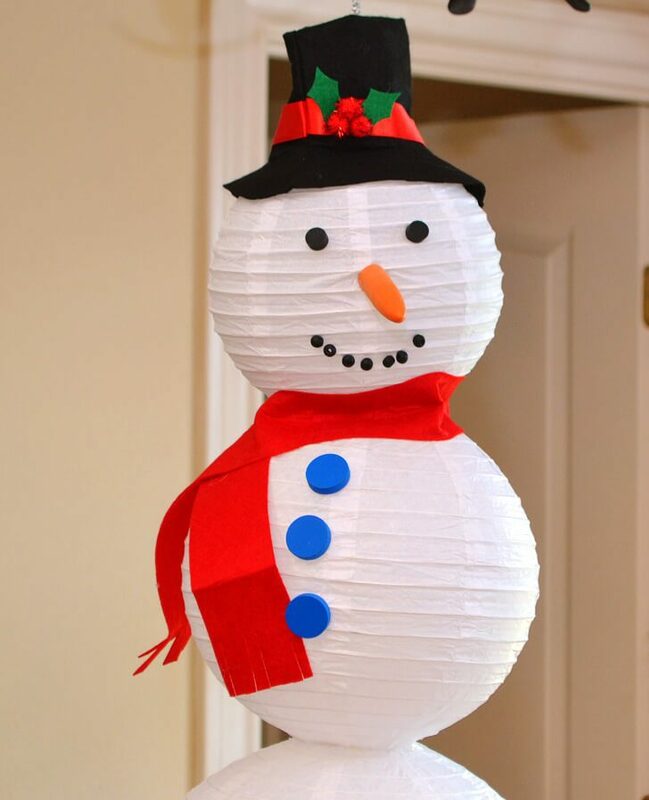 Apparently they are envisioning a beady eyed snowman with a boho type sensibility with a huge, floppy hat. I wound up pinning my hat to make it smaller and that worked just fine. I had initially found a little cute hat in the kid’s department I was going to snap up but this was included so it’s what I did instead! 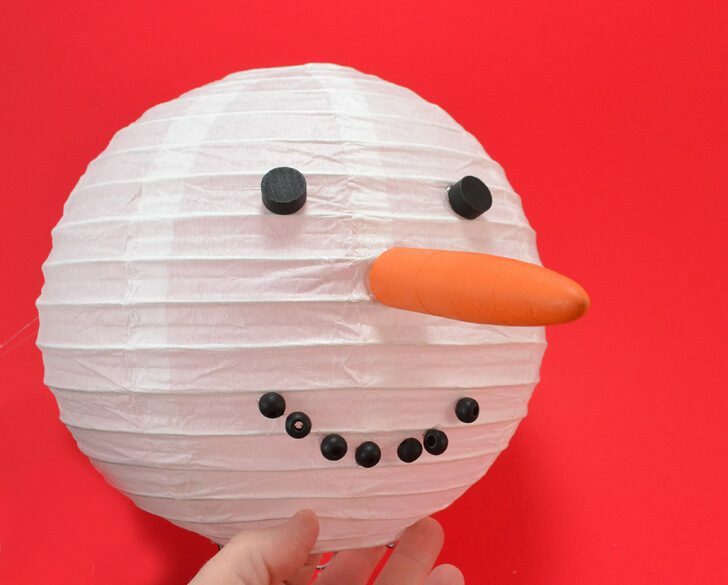 My snowman kit has little black eyes, like way little, a wooden carrot nose and beads for the smile. 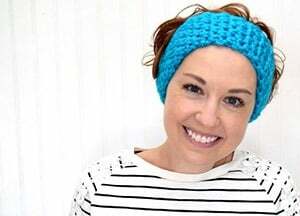 There are also blue buttons and a length of felt to act as a scarf. 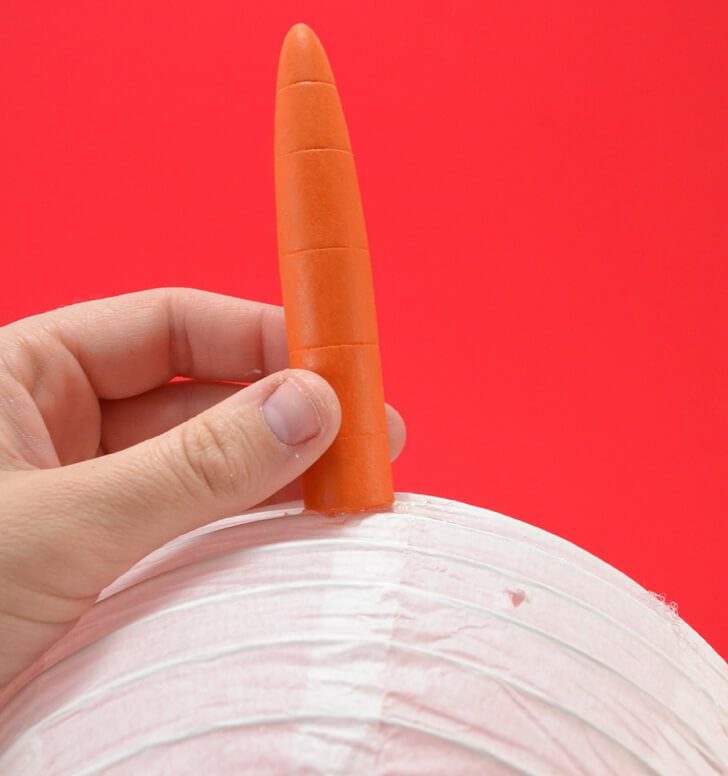 My initial plan was to make my own carrot out of orange clay and that would have been just as well, really. This nose is a bit on the large side but I say it gives my guy character! I hot glued my bits and bobs onto the smallest of the 3 paper lanterns and then I realized it was upside down. Yup. Oops. Since I did my middle the right way and my top the wrong way I had to maneuver the thing so that my two hooks would both hang out together. It was a pain in the royal behind. You will just put the top and the bottom together and be set! To keep our head from tipping over we need to add weight to the back. We’re going to keep our top and bottom together and weight the back all in one go with clothes pins. 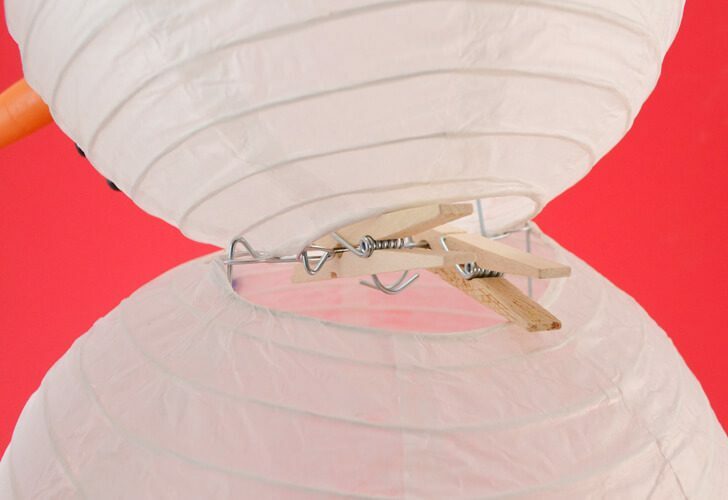 Use 2-4 pins to clamp together the metal inserts from the top and bottom lanterns. Make sure they’re both turned the right way. This may go without saying but this ain’t my first rodeo and I did get it all mixed up before I hit it with the hot glue, thank goodness! 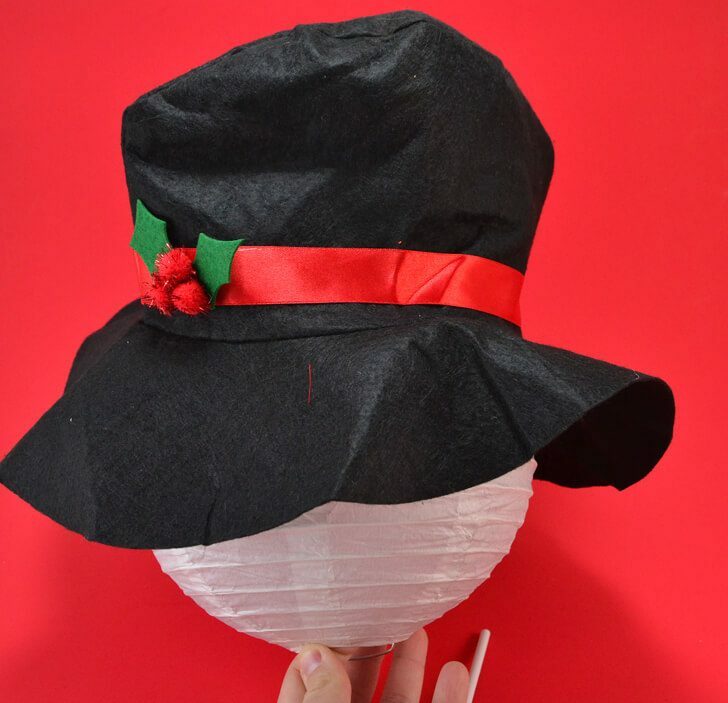 Place hot glue on the back side of the the middle paper lantern and push the clothespins down to connect. Hold until the glue sets. 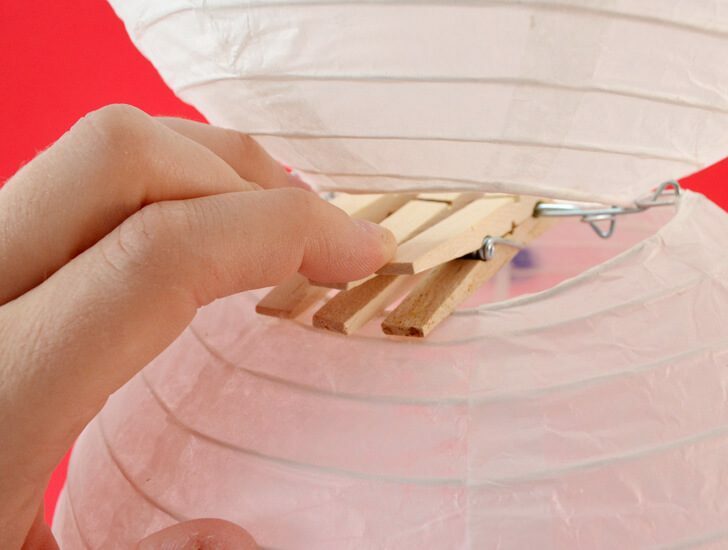 Glue the top paper lantern to the tops of the clothespins wherever they easily and naturally will touch. 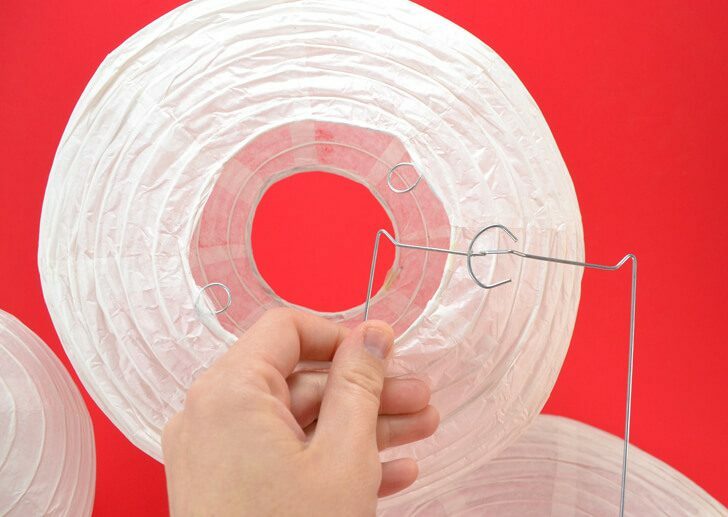 Glue the bottom and last paper lantern onto the bottom.For this one you can just glue paper to paper. 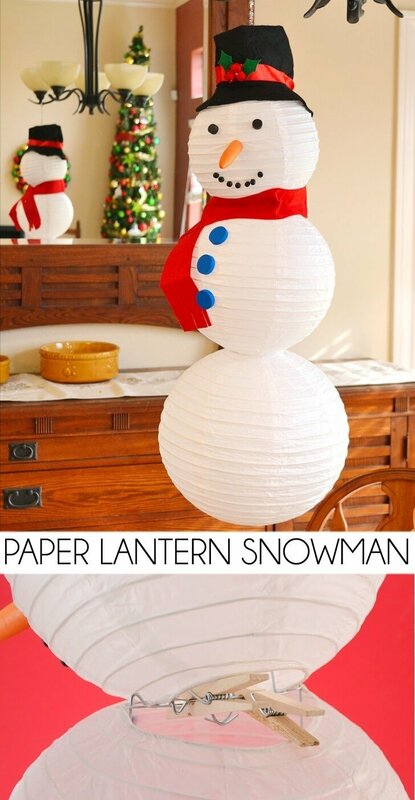 You’ll need to squish both lanterns to get it to fit that way. Use clothespins if you have to but it should be doable without them. 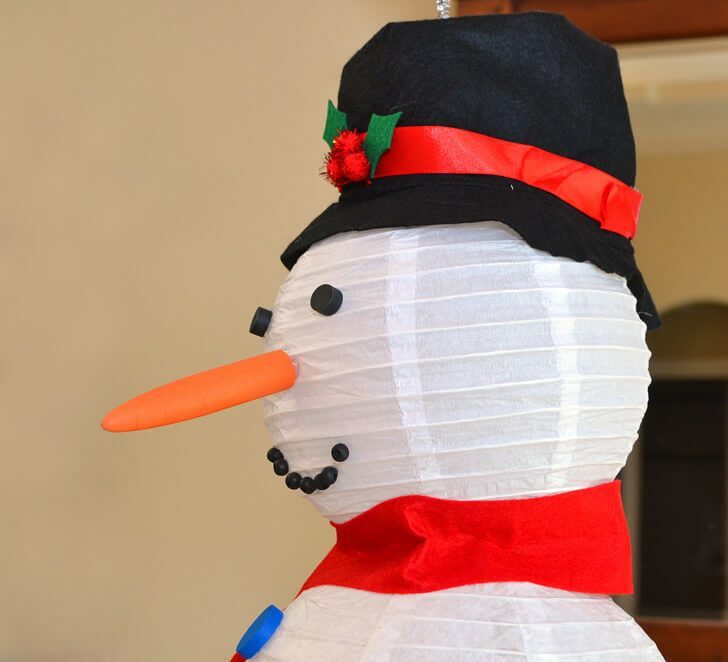 Now it’s time to add your length of felt around the neck to hide that ugly seam and warm your chilly snowman right on up. Fringe the ends if you like or leave as is! 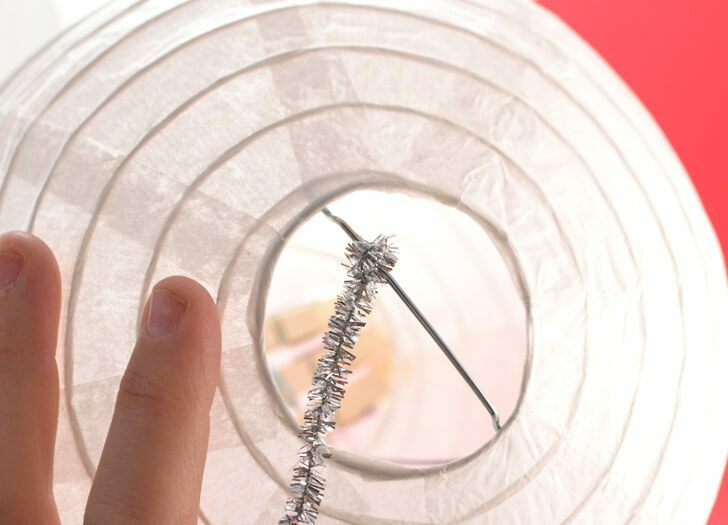 To hang run a pipe cleaner around the wire holder of the head lantern a good 2 or three times. Now that is one heck of a schnoz is it not?